Yesterday, the anti-immigration candidate Geert Wilders lost the election in the Netherlands. While Wilders' message of reducing violence by cutting Islamic immigration was a "libertarian" end, the "means" was authoritarian in nature. So despite the fact that most libertarians lean Right, yesterday's strongly libertarian astrological signature did not necessarily point to a Right-wing win. 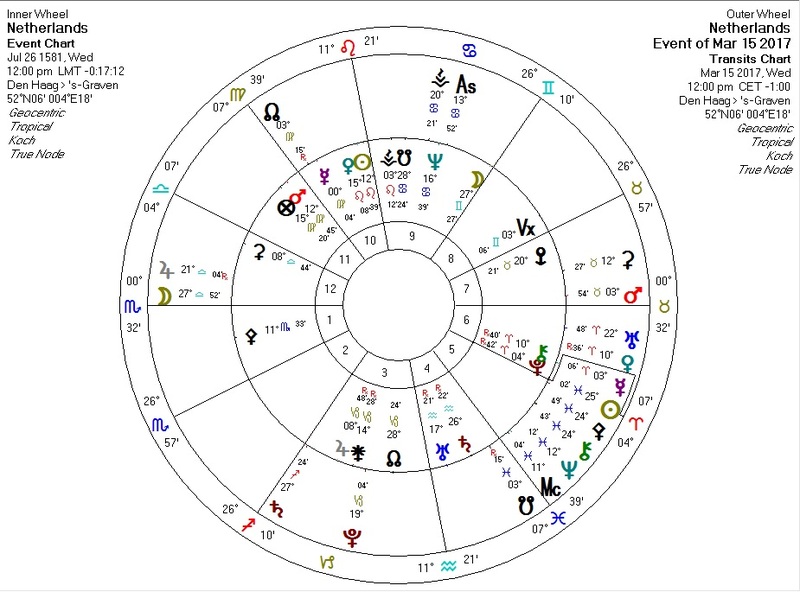 Transiting Sun/Pallas/Chiron trine Netherlands South Node in Cancer and (probably) square Netherlands Moon: an ethical adjustment (Sun/Pallas/Chiron) contributing to the loss of homeland (South Node in Cancer) and in conflict with native interests (Moon). This Sun/Pallas/Chiron conjunction also opposes the US Sibley Neptune in the Ninth, suggesting ethical struggle versus laws regarding foreigners and corresponding to yesterday's court decision against the Trump travel ban in the US. Transiting Sun/Pallas/Chiron square transiting Saturn in Sagittarius: ethical adjustment versus restriction of travel. Spacer79March 17, 2017 at 4:34 PM So Netherlands is screwed? Maybe they will see when their country goes to shot more than it already is that it's time for a revolution. What astrological aspect would Trump need in order to make the travel ban stick? Perhaps you should try to contact Trump and become his astrologer. Ronald Reagan had an astrologer. ReplyDelete Replies astrolibertarianMarch 17, 2017 at 4:46 PM I hesitate to declare anyone beyond hope or beyond danger. One never knows. To make a travel ban stick, you'd probably need Saturn in aspect to Jupiter and/or Neptune in some form. Reagan's astrologer never knew she was working for Reagan -- she was contacted by proxies. Delete Spacer79March 17, 2017 at 4:51 PM Still, Trump could use one, he seems to be making moves when he is at an astrological disadvantage. Delete astrolibertarianMarch 17, 2017 at 5:29 PM He's welcome to hire me. Preferably after he's gotten rid of the wiretaps and spies in his administration. Delete Spacer79March 18, 2017 at 8:47 AM Haha.